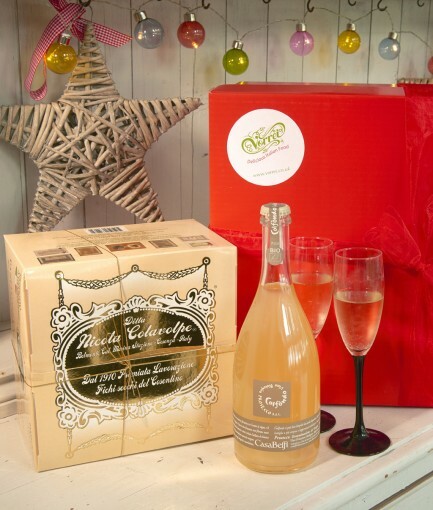 Home » Our Favourite Boozy Christmas Hampers! Nothing says Christmas like fabulous boozy hampers! 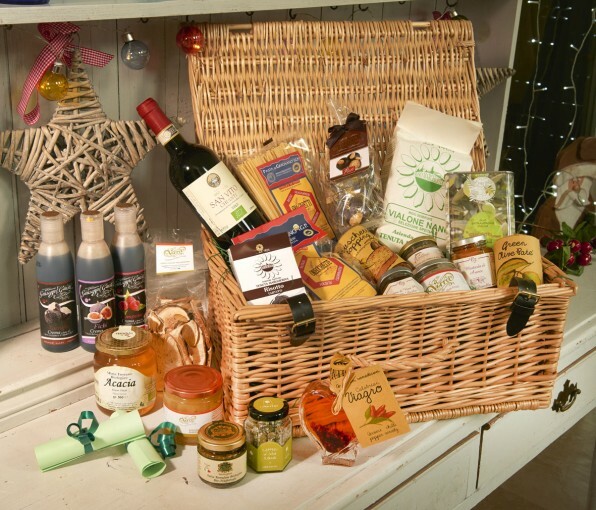 And here at Vorrei we have an outstanding selection of indulgent gifts that any adult will love, combining delicious Italian treats and some wonderful organic tipples. Your friends, family and colleages will absolutely love these Boozy Christmas Hampers and you will definitely be crowned best Christmas present donor of the year! Here are our Favourite Boozy Christmas Hampers for you to check out. Pick your favourites and add them to your list! This is the right hamper for lovers of fine wines! 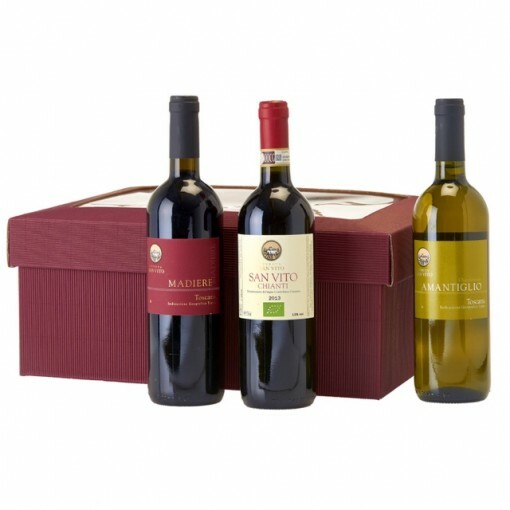 The recipient of this fantastic present will love the choice of three different wines coming from the luscious land of Tuscany. In the hamper you will find an award-winning San Vito Chianti 13% with its full body and fresh fruity bouquet of flavours, a Toscana Madiere IGT 13% full of an aromatic wild berries taste and a Chardonnay Amantiglio Toscana IGT 13%, crispy and acid and with a fruity aroma. All these wines are certified organic and come from the beautiful Tenuta San Vito, a historic wine estate situated amidst the Chianti hills of Tuscany, just minutes from the fascinating Florence. Here winemaking is an art and organic is the keyword! 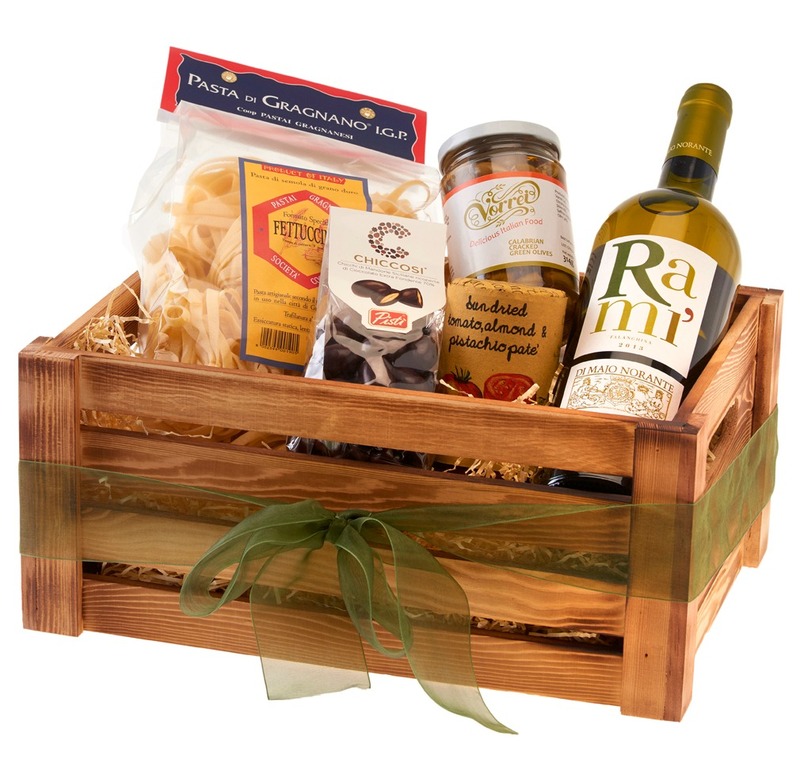 This hamper will certainly make a statement and be very much appreciated by wine lovers. This Christmas hamper is certainly going to be appreciated by your friends and family who have a sweet tooth. In this hamper you will find an amazing Artisan Panettone handmade by Colavolpe in Southern Italy exclusively for Vorrei! This amazing company is a three generation family-run business in Calabria which makes the most delicious Italian sweets ever! To accompany the Panettone is a wonderful Organic Prosecco Colfondo DOC from Casa Belfi. This prosecco is bio-dynamic and natural and has an amazing taste! It’s peculiarity is the yeast at the bottom of the bottle which makes it soft and longer-lasting. This Prosecco is the perfect balance between delicious and natural! Cheese and wine – is there a better combination?! We don’t think so and in celebration of this perfect pairing have put together the ultimate cheese and wine party kit. 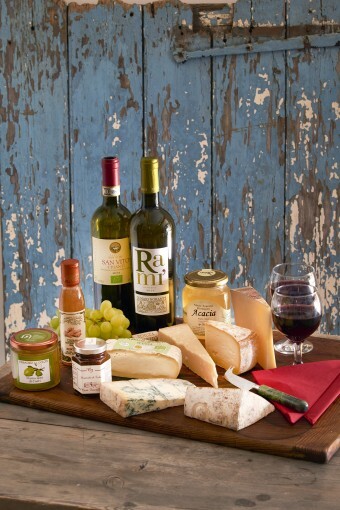 It’s packed with mouthwatering Italian cheeses, delicious accompaniments and superb wines. It makes a brilliant gift for your party host or hostess or a tasty treat for you! It includes two bottles of our favourite organic wines, six authentic, very yummy mountain cheeses and four spreads to pair with them. There’s an abundance of wonderful, naturally vegan food in Italy and we have chosen some of our favourite products to include in this marvellous Dinner Hamper along with an excellent vegan white wine. 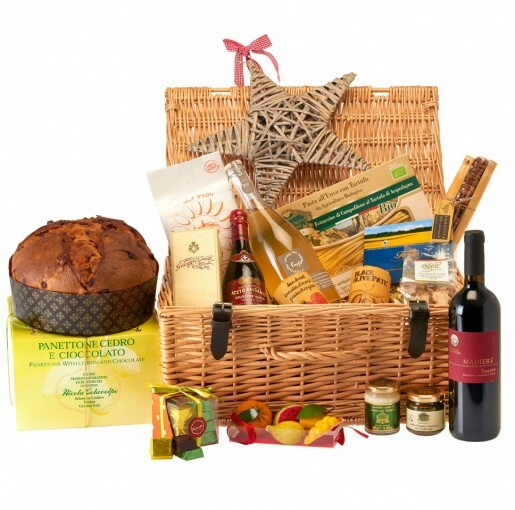 This hamper will set you up with everything you need to create a romantic, Italian meal at home this Christmas and as well as the delectable Falanghina wine includes an antipasto, pasta dish and dessert. It also makes a really thoughtful gift for foodie friends who recognise a really good bottle of Italian wine. All these delicacies come carefully wrapped in a huge treasure chest wicker basket tied with a colourful ribbon! This really is the ultimate luxury gift that will be remembered for years to come! Remember: you can always mix and match your own products and choice of wines to create your own very personal Boozy Christmas Hampers tailored to your friend’s and family’s tastes!